I’m running on about 4 1/2 hours of sleep and I blame Bob Costas. I’m of the mind to write a strongly worded letter to NBC taking them to task for keeping me up until 1:30 am every night this week. For all of you that don’t live in the Pacific Time Zone, let me fill you in. The other time zones get the live feed of the Olympics. The west coast gets it tape delayed. What kind of crap is this, NBC? You didn’t even air the gymnastics until after 11 pm!!! You know perfectly well that I can’t stop watching an event after it starts. It’s like leaving a baseball game in the sixth inning when the pitcher is throwing a perfect game. I just don’t do it. So, NBC, you bastards, when I get fired today for falling asleep on my desk, you can expect to hear from my lawyer. PS if you are my boss, I did not write this at my desk at work. Moving on. This post is going to be as interesting as a bag of rocks thanks to my sleepiness. Or maybe it will be awesome because I have no idea what I’m writing. My eyes are totally closed right now. I’m an excellent typist. Thanks, fourth grade computer lab! Mike and I were interviewed by the awesome Daddy Dan. I linked to it in my last post, but for those of you that didn’t click on that random link here it is again. Go on. I demand you click on it. Wait, I’m sorry. I don’t want to be demanding. I love you. Click on it if you want. But you should want to, because Mike and I are cool and Daddy Dan has an adorable kid who is about to celebrate his second birthday. So, Jackie! has a website and it’s run by her older sister Stephanie. Stephanie is Jackie!’s oldest and therefore most frightening sister. I’ve hesitated to link to her site until today. Why today? Well, Stephanie has challenged all of Jackie!’s admirers to leave Jackie! a comment on her guest book. Stephanie’s goal is to have a comment from all 50 states. I thought, “hey Heath (I call myself Heath), you should finally link to Jackie!’s site – you have readers all over the place.” So, okay friends (I call you my friends), if you are so inclined (because I still don’t want to be demanding), here is the link to Jackie!’s site. Please leave her a comment telling her I am pretty, and be sure to refer to her as Jackie! so she knows you came over via me. And, be sure to leave the state or country you’re in so she knows people are pulling for her from all over the place. Make me proud, friends. Last thing! A bunch of my coworkers got spammed by me yesterday. I love to spam my coworkers because they are all super-awesome workers, and I like to distract people to the point of annoyance. I’m a gem. Anyway, I wrote it with the intention of also posting it on my blog. So here it is. I’m tired, deal with it. Okay People. So listen. I have this baby, right? And I think she’s cute and stuff. I’m her mom, that’s my job. Anyway, my aunt & her friend convinced me to enter Maddie into a beautiful baby contest. But I don’t like to think of it that way. I prefer to think of it as a SCHOLARSHIP PROGRAM. So, won’t you go help my baby go to college and realize the American Dream of being educated without the terrible terrible burden of student loans and crippling debt that will put her in the hole before she even begins her life? I mean, some people have debt so bad that they have to live under overpasses and beg for enough money just to buy a crappy cup of noodles, and they have to open up like five credit cards and they max out all of them and they are constantly running from creditors and THE MAN and their lives end up in the crapper just because they didn’t win a baby scholarship program and DO YOU WANT THIS TO HAPPEN TO MY DAUGHTER?! Of course not. So here’s what you do. First, you go to this website. Then, you click on View M. A pop-up window will open. The first baby is some chick named Mackenzie. She’s just alright. She clearly has no sense of style, no joie de vivre. You are over her and you haven’t even seen her. So, you click on the right arrow to see Contestant 2, and then your eyes will be met with a VISION. The vision of my baby smiling at you, practically begging you to keep her off the mean streets of LA. You will look at her picture and agree that she deserves more than cup o noodles for dinner. NEXT! You are going to minimize that pop-up window, so you are looking at the first screen again. Click on the “VOTE” button below the View M gallery. Then click the circle next to Contestant 2 (Maddie). Scroll down, enter your email address, and then click “Cast Your Vote.” You will get an email confirming that you’re a real person, click on the link in the email, and then your vote will count. Yeah, I know it’s a lot of steps. But seriously, think of the baby, people. A vote for Maddie is a vote for keeping tiny babies off the street. FOR REALS. And, if you have any friends who want to keep babies off the streets, feel free to pass this on. Don’t you wish you worked with me? Well I certainly don’t want to see Maddie on the streets. so i am off to vote now! Thanks for the 2nd plug, Heather! I’m with you on the late-night Olympics coverage….WTF??? I’ve been up until 12:30 every night this week. I’m off to send my best wishes to Jackie! and vote for Maddie…. Daddy Dans last blog post..Bigfoot continued….. The Eyelash Queen of the World just got my vote. Gawjus! the olympics have taken over my life. seriously. I Tivo’d last night’s and then fell asleep. The suspension is ruined. But it keeps me from killing people during the day. DUDE!? Am I considered a co-worker now? Cause that’s awesome! I already voted, because I do everything you tell me. Now I need to go check out the interview and head over to Jackie!’s site. I’m on my blackberry btw, so this comment has taken FOREVER to type. And now I have a hand cramp. Dude, I am so leaving Jackie! messages from every country in Europe that I go to. Then I am going to fire away from home. I cast a vote for the lovely Maddie – I would have voted for her anyway – she was by FAR the most beautiful. Those eyes! I’ve read and voted and commented. My clicky finger totally needs a nap now. Thanks, Heather! Done and done. I’m a freaking moron because I am apparently the only person who didn’t leave Jackie! a hug. That was a whole lotta steps. You need to send me a cookie for voting. Probably many cookies. I am off to vote *and* to leave the spectacular Jackie! a comment on her blog. I have to admit that I have not watched one second of the Olympics this year. Not one. I know – I’m so un – American. preTzels last blog post.."Turn Your Head and Cough Please." Street babies scare me, so I voted for Maddie too. Must not look at all the babies…have work to do….but they are so dang cute. Dang you’re hilarious. I had to read this blog out loud to my co-worker (aka sister-in-law) and we were both totally laughing our butts off. And we also have to say AMEN to your comment about the Olympics being on too late because we all have the same problem and I, for one, am exhausted! Thanks for brightening up my day! Can you vote from different email addresses? Since you’re not the only one who’s not being terribly productive at work today, I’ll go off to do your bidding right now. No one wants to see Street Baby Maddie. Oh my goodness, there sure are a lot of Maddisons out there, aren’t there? Let me cross that off my list of possible baby names. Heather, very funny. I’m with you, the Olympics are sucking the life right out of me. But yet, I can’t look away…must watch…can’t sleep. Because I’d hate to see Maddie working the pole so she can cover another semester at Vo-tech to FINALLY get that welding certificate, I voted for little ms. Luscious eyes! Whoops…here it is. Strange man. 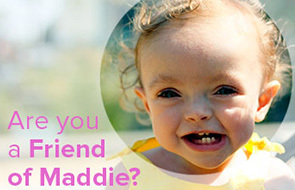 I don’t have to work with you – I totally voted for Maddie without looking at anyone else – she is the cutest! Mary Beths last blog post..PACKING! PACKING! PACKING!!! OK–I voted. I hope she wins!! Ah you people with your sports addictions! my mum and brother suffer the same fate. me i can go years without watching someone do something even vaguely sporty. doesn’t mean i’m a lard arse but me and sport we’re not really friends. go maddie, go jackie! Hmm….to vote for Maddy, or to enter Erin into the contest and vote for her instead……what to do, what to do……..
Don’t know if you accept these or not, but I’ve nominated your blog for the E is for Excellent award! See here. And now I’ve nominated Maddie for Most Beautiful Baby! Good luck! I hate the west coast Olympic tape delay. DO YOU HEAR US NBC4????? It ducks big donkey balls and I/we may be forced to launch a letter writing campaign to fix this. I hate it hate it hate it!!!!! Headless Moms last blog post..Ha! And You Thought The Complaining Was Over!